"There's a silent revolution brewing in India, and it's called The Ugly Indian. It is anonymous, faceless and leaderless, and has seen thousands of citizens coming out to fix local civic problems following a simple motto: Kaam Chalu Mooh Bandh. Only Work No Talk". After all the years of betrayal, and only since the inception of a high-powered Royal Commission set up to investigate institutional sexual abuse, Cardinal Pell, Australia's foremost Roman Catholic official, now admits long years of Church silence and cover-up. 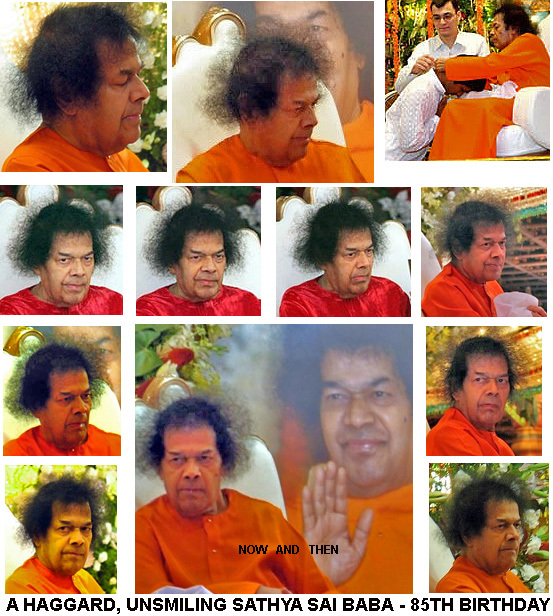 On Sathya Sai Baba: Times of India, Ex-Chief Justice Interview. What Judge Would So Opine? Locked in a vast effort, following both earlier and more recent exposures, the international Sathya Sai Organization, having lost many members, struggles desperately to rebuild, and at least keep somehow afloat, the Sathya Sai empire. The Indian media is well-placed to ask Baba Hazare and/or his official spokesperson to confirm or deny the report on Sai Global Harmony? But will they? Will they ever attempt to atone for their shame in allowing the foreign media to expose Sathya Sai Baba and his cult? Alert sleuths may also like to see whether Sai Global Harmony almost talking to itself, and a smattering of NRI’s and others around the world – speaking essentially to the converted. If not, the Sathya Sai Organisation’s repeated statements (which we can document from official Sai literature) about having vast followings worldwide are yet again exposed as false. “We are being watched by many organisations, the government and many other institutions in India and abroad. That’s why we thought we will take measured steps”. Indeed, this international attention of which Naganand speaks has been very much part of our job to ensure. It is our point about the utter failure of the Sathya Sai Organization to show accountability that the cult from top to bottom has reviled and libeled those who have – with rational voice – spoken out. But from the cult, there is not a word of apology for all the hatred vented against former devotees and other critics. Ashok Bhagani – Footsying With Top Blair Minister? Below, I have excerpted from my articles posted on or close to each Sathya Sai Baba birthday celebration. These go back to 2007, the year in which I began ‘Call For Media and Government Investigation of Sathya Sai Baba. One of the key reasons why Robert Priddy and I continue to expose the Sathya Sai Baba cult is that his worldwide Sathya Sai Organization, though it is in vast public discredit and struggling to remain intact, continues to draw unwitting people into its thrall. Now and then, members of major international media continue to consult us, and find us unflaggingly truthful, carefully analytic and responsible, as do other organizations and persons who stand against cultic dangers to human well-being. Repeatedly, it is the many Sathya Sai Baba devotees who – abjectly forgetful of Sai Baba’s constantly harped-upon preachments about love, peace and sweet-spokenness – break the teachings common to many religions and philosophical systems . Their commonsense and decency paralysed, they cannot look at critical facts, rationally and truthfully presented. Cruelly, they libel those who have stood forth – persons they had long respected and served alongside, year after year, when we shared devotion for Sai Baba. From the moment we raised our voiced in question, devotees shunned and reviled us. In untold ways, they twisted our words and intentions. They attacked our worthy standing in our professions, trades and wider communities. Ever more sadly, there were attacks against our families, including our children. Prominent leaders in the Sathya Sai Organization – including those who were close to Sai Baba and part of the Saibabaofindia.com party – have long supported the most vicious and dishonest attacker of former devotees and other critics, Gerald ‘Joe’ Moreno, of Las Cruces, New Mexico, USA. So intensive were his attempts to sabotage the Wikipedia article on Sathya Sai Baba that he was permanently banned, along with an associate. Ironically, many Sai devotees refused to associate with him, and voices for reason, such as Adrian Hoogenbosch, urged that speaking offensively to Sai Baba’s critics was not spiritually or ethically tenable. Puttaparthi Sai Baba Birthday 2011 – Where Have All The Golden Pomp and Circumstance Gone? The late Sathya Sai Baba’s birthday celebrations occur on 23 November. As usual, around this time, there is an upsurge of visitors to this blogsite and that of Robert Priddy. However, in comparison to other years, the numbers are much down, very much as Sai Baba himself is forever down in the earth, and his devotees infinitely down in the dumps. Here is a simple test: Ask any Argentinian whether this statement is true. If it is not, ergo – this Sathya is not telling the truth or is credulous and badly misinformed! But, then, how can this be so? For he has long said that he is All-knowing and All-seeing …. Is Puttaparthi Glitter the ‘Shining India’? Often, there is the tacit assumption that to criticize Sathya Sai Baba is itself a slight against India. This is offensive to a great many Indians from all walks of life who do not think that Sai Baba is a reflection of all that is good in their country. Anyone who has lived in India lengthily, as I have, comes to know how profoundly Indians across classes and divides deplore the corruptions and abuses of human rights and democratic freedoms which they see perpetrated by the power elites in their country. Yet this is the India that Sai Baba has said he will transform. He has spoken of first “cleaning up his own backyard”, before saving the entire world before he dies. He is now very old and sick. 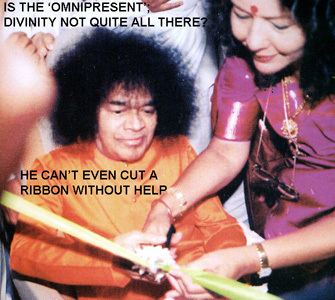 Sathya Sai Baba’s many reported weeping episodes have taken – as from circa the year 2000 – a marked upsweep after the advent of worldwide exposure of widespread serial sexual abuse of boys and young men (See also HERE and HERE); his implication in the massive local, state and central governments’ cover up of police killings in his bedroom at Puttaparthi (See HERE and HERE and HERE); vast misappropriation of billions in funds collected worldwide (See HERE and HERE and HERE); his vast opulence in a land of great poverty, squalor, ignorance and superstition; his failed predictions (See HERE and HERE); and much else that reveals him to be one of history’s great imposters, whatever may be the good deeds that he has sparked off in many of his devotees. 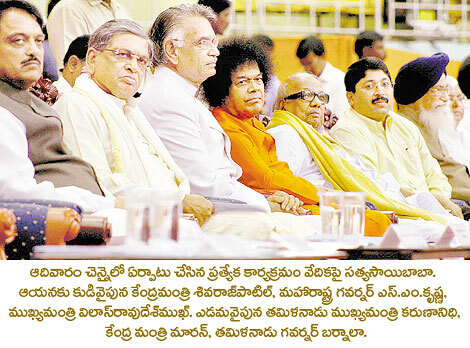 Sathya Sai Baba 84th Birthday Celebrations. Will 21st Century India Tolerate The Shame That Is Puttaparthi? “His college students had the privilege to see another unique creation in the Ootacamund Summer Course in June 1976. Svami, who declared that He would live to see ninety six years in this body, mentioned that eighteen important institutions would be established by Him all over India in the remaining forty six years, and circled His hand. Many have heard and read where he says that the whole world will be under his rulership, and that he will return in the name of Prema Sai Baba to complete this work. 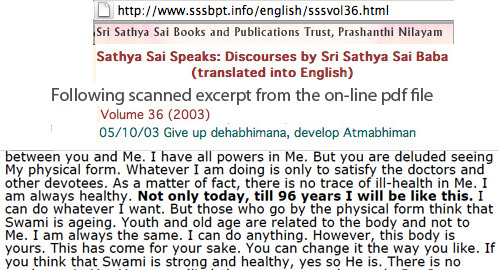 In a 1961 Discourse, he said: “I shall be in this body for 58 years more; I have assured you of this already.” (Sathya Sai Speaks, II, 18:92.) A year previously, he said: “I will be in this mortal human form for 59 years more and I shall certainly meet the purpose of this avathaar, do not doubt it. 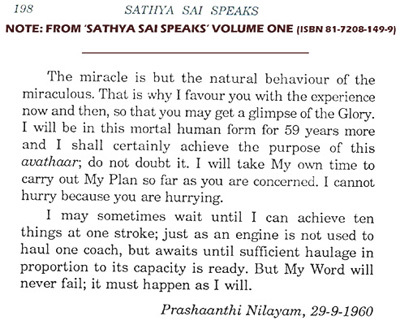 I will take My own time and carry out My Plan as far as you are concerned.” (I, 31:198; Prashanthi Nilayam 29-9-1960 – second discourse) Both these statements indicate a death date 2019 (although he would not use the ‘word’ death) of 2019. Other statements in official publications confuse the issue by stating 2022. Sathya Sai Baba Birthday, 2009. Where have all the “millions” Gone? PUTTAPARTHI: The 84th birthday celebrations of Sri Satya Saibaba were held at Sai Kulwant Hall in Prashanti Nilayam in Puttaparthi. Saibaba has formally cut the cake to mark his birthday in the presence of several dignitaries and thousands of devotees who thronged to witness the celebrations. 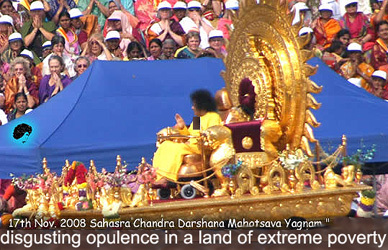 Click to find the video link that shows Sathya Sai Baba in 2007 just as unable to cut his own birthday cake as exposed in the 2009 report of the Express News Service. For some time, he has had a mask-like face, suggestive of a degenerative disease. Sai Baba’s health – miracle or self-sacrifice? Sathya Sai miracle of transformation of India? Pride is said to come before a fall. In the case of Sathya Sai Baba, the absurd and obscene pomp now come during a fall, since we are now in a better place to see the imperial decay suggested in my article The Decline and Fall of The Showman Empire. (For the busy reader, there is a condensed version, Sai Baba’s Undivine Downfall). For a photographic glimpse of the incredible lavish material ‘spendour of Puttaparthi’, see Sai Baba, Kubla Khan, Citizen Kane, Bill Gates et alia. Or my reader may like to view some Sathya Sai Baba Chariots. In the selfsame India, there is, with what deepest irony, a profoundly genuine splendour, down thousands of years, of saints and sages living in the utmost simplicity. Where Do Sathya Sai Baba’s Riches Come From? Fortunately, a television documentary such as the BBC’s The Secret Swami was one of the means by which networked former Sai Baba devotees from several countries have found to communicate our testimony worldwide. A piece from the BBC’s publicity department gives a small idea of the sheer impact caused by coverage of dissenting views of Sai Baba and his cult, the Sathya Sai Organization. More millions have viewed DR’s Seduced, Azul TV’s Divine Sin, and read articles in major news media in India, UK, Europe, Canada, Australia, and so on. See, Exposure of Sathya Sai Baba. Media Source List. Since our work of international exposure via world leading media began in 1999, the cult has suffered regular resignation upheavals, including of foremost leaders. Indeed, many people leave informally. With a vast amount of work, we used our professional credit to tell many mainstream, reputable religious and civic institutions. They were the target of the Sai cult, avid for wider community acceptance. Our work severely hit the cult’s extensive, and often high-level, fundraising and recruiting efforts around the world. Below are a few quotes from my articles, over time, which may help to cut the search times of those looking for an overview. In a day or so, I shall include a similar page of articles about a number of Sai Baba’s past birthday celebrations. Sai Baba To Be Seen In Moon? But Where Was Moon? It is interesting that so many devotees have assumed that the vision apparently promised by Sai Baba via his chief translator and close servitor Professor Anil Kumar to many thousands of devotees gathered at his Puttaparthi ashram would entail seeing the form of Sai Baba on the moon. If they had consulted their timeless sacred classic, Bhagavad Gita, Chapter 11, they might have recalled that the vision granted by Sri Krishna to Lord Arjuna (vishwarupa or vishvarupa darshana) was of a very different character. It was not the form of Sri Krishna – who was right beside him! – but a cosmic vision of enormous range and depth. But what fools who rush, with faces agog, to Sai Baba’s local airport would ever want something both so fierce as that? Was it not enough for them to have seen it where they had daily darshan (sight) of him within his Puttaparthi ashram? Why all the sensationalism, and indeed threat to life or injury, of thousands of devotees rushing headlong to his nearby private airport? Is an unruly crowd, which police had great difficulty in controlling, likely in a fit state to receive a divine and blissful vision? Certainly, if it was the form of Sathya Sai Baba that was so eagerly sought after by the crowds of devotees, they have entirely missed one of his most insistent teachings: that the form is not what is important – but learning that attachment to the form is deleterious to spiritual growth. Sai Baba devotees have an appalling record for their maltreatment of former devotees. They have repeatedly vilified, shunned, made apostates out to be liars and fools, cruelly libelled them on the internet, and threatened with law suits and criminal proceedings. Likewise appearing to think that we were panicky lambs, the Sathya Sai Baba supporter Kulwant Rai, one of India’s wealthiest moguls, and scion of the Rai family, various of whom are Sathya Sai Baba devotees, threatened us via his lawyers. With scarcely a penny in our pockets – at that time! – our forces welcomed them to go ahead. We wanted the facts to come out. Our course was, and is, entirely just. We had nothing to hide, but they did, so they threatened like bovver boys. They – having too much to hide – went away. More’s the pity. Bullies often turn out to be cowards. Which is one of a number of compelling reasons why one must stand up to them. Give them a field day, and one, inevitably, will sink into the slush, having become a coward oneself. Sai Baba controls with an iron hand the international Sathya Sai Organization. Senior investigators from the world’s top media like the BBC, Times of London, Daily Telegraph, The Guardian, and in other countries, as well as UNESCO, the U.S. State Department and other institutions deemed the cult extremely hard to investigate or act against. His second most senior aide is its deputy chairman, who, as head of Sai Global Harmony, is his ‘minister of propaganda’, Dr G. Venkataraman, one of the progenitors of India’s atomic bomb, as was Sai Baba’s previous close aide, the late Dr S. Bhagavantam – sometimes called ‘the father of the Indian atomic bomb’ – as was his present staunch devotee, the President of India, Dr A.J. P. Kalam, who writes flowery panegyrics to Sai Baba, as did the last Indian Prime Minister, Atal Bihari Vajpayee. Sai Global Harmony affiliates with WorldSpace International Satellite Radio Service, 24/7 and broadcasts to many countries. With a behind-the-scenes corporate-style, assisted by the billions of funds that pour from many countries into the Sathya Sai Central Trust, the declared aim is to penetrate to every corner of the globe. The ‘Select Readings’ cited below show how Hislop, and the top leadership in the U.S. Sai Baba hierarchy (and the incredibly docile lower-echelon leadership worldwide), covered up the seriousness of allegations of Sai Baba’s serial sexual abuse of boys and young men. No doubt, they seriously and sincerely thought they were doing the right thing. At the same time, they were guilty of the most extraordinary lack of duty of care towards those they had until now, for years, honored and respected. John Hislop’s Successor, Dr Michael Goldstein of Covena, southern California, USA, is now world leader of the international Sathya Sai Organization, which Sai Baba said is THE divine organization on earth. But it is a multi-billion dollar organization with iron-clad, cultic rules. Goldstein exploded with unprovoked anger, not realizing that the BBC had a hidden camera trained on him. BBC hidden camera reveals Sai Baba’s world leader in fit of anger. Goldstein’s bullying, coldness and general nastiness – and such qualities in a number of other high echelon Sai Baba hand-picked leaders – cannot be denied. Likewise, often out-of-sight were Sai Baba’s angry discharges. No truthful explanation would resolve the many contradictions in Sai Baba’s published discourses. Academics such as Robert Priddy and Brian Steel have scrutinized much of this literature. Those who retaliated – chiefly Gerald ‘Joe’ Moreno – are poorly educated. They use fallacious arguments such as argumentum ad hominem. They viciously name-call. They use spurious interpretations of what we have written. They deliver us the distinct, though unintended advantage among serious, thoughtful readers. Indeed, in the case of Moreno and an assistant, Wikipedia banned them. To those coordinating activities, such as Glen Meloy, Hari Sampath, myself and, as time passed, Robert Priddy, the sheer volume and richness of evidence strikingly and repeatedly verified accounts. Is Isaac Tigrett Sai Baba’s ‘Walking Will’? Guru Purnima Revelation Or A Fall? But questions arise – What, in these days of immense disruption and confusion within the Sai movement, in exactly what might this entity consist? And what might be its supreme command center? Is it the Sathya Sai Central Trust? Or the international Sathya Sai Organization? Will Tigrett, long known to have something of a mind of his own, be quite happy to bypass the likes of Rathnakar and Srinivasan and deal with the wider organized fold of Sai devotees? Not least those great many donors who are deeply suspicious about the trustworthiness of the Sai Central trust – or some members of it. They worry about what happened to their donations. We are talking billions, and not in rupees, either! In the next days, I shall look at aspects of the Occupy movements, many of whose manifestations show how profoundly Sathya Sai Baba and his international organization have failed. Sathya Sai Baba and his cult always failed to face political and corporate power. They themselves are part of the corrupt system. His successors now fight out power struggles among themselves. The international Sathya Sai Organization “good works” philosophy plays perfectly into the hands of the power elites, who have nothing against charity. We all like to feel good. 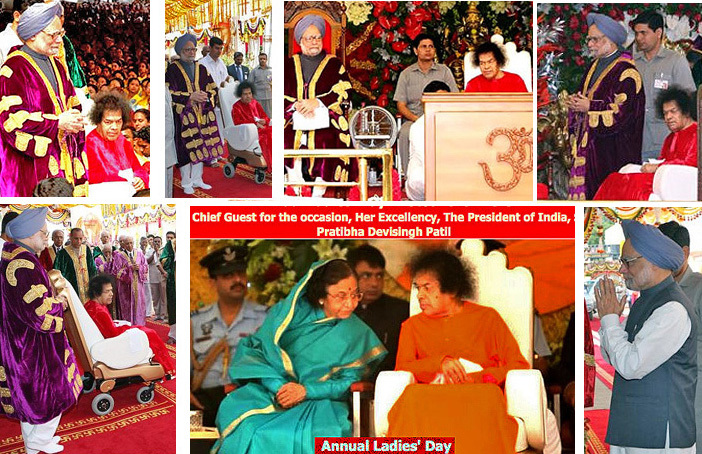 Big-name donors to the Sathya Sai cult are legion, especially in India, and from among the Indian diaspora worldwide. But those many ‘ordinary’ citizens from many cultural backgrounds who people the Occupy movements are better educated than ever before, and thus able to use social media such as Twitter, Facebook, YouTube etc., to great advantage. Sathya Sai Baba and his organization could never, and would never, have initiated or supported a mass movement like the Occupy movement. This populist manifestation is profoundly opposed to the corrupt machinations of government and corporations – whereas, Sai Baba and the top-level figures of his organization have long been utterly enmeshed with government, police and armed services at every level. Many of his richest devotees long were, and are to this day, corporate moguls. He, his intelligence and security wing, and his formal and informal political operators have for decades utterly influenced local, state and central government police, who are notorious for violent suppression of protest at the behest of Indian governments of any persuasion. The greed-maddened heads of corporations whom the Occupy movements oppose are, in essence, no different to those far more visible celebrities from the entertainment world who live in the utmost opulence but simultaneously adorn their inflated egos with ostentatious finery when they appear at charity fund-raisers. 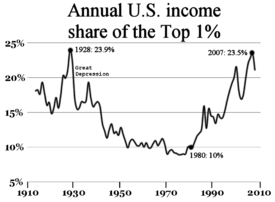 From Wikipedia: A chart showing the disparity in income distribution in the United States. 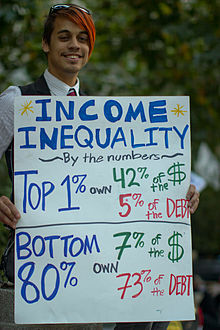 Wealth inequality and income inequality have been central concerns among Occupy Wall Street protesters. CBO data shows that in 1980, the top 1% earned 9.1% of all income, while in 2006 they earned 18.8% of all income. But far beyond the ‘feel good’ point, the governments and corporations keep up the profiteering, and aid the spawning of the soul-destroying, planet-killing life-styles. From their almost impenetrable fortresses, they aid and abet poverty and social dislocation in the first place. The US, history’s most formidable superpower is in vast economic decline. But this should really serve to remind many other countries that, in many ways, the US is only themselves writ large – both actually and in unachieved aspiration. Materialism is always itself, and always expands when it can. Millions of ordinary US citizens – and in increasingly many other first world and developing countries – now rebel against the governments and corporations. They need no Marx and Engels to read nor a Lenin to rally them. They come from many religious and non-religious backgrounds. They come from the smallest towns and the largest cities. They are the young, who face decades of paying back their student loans, whom the flawed system catapults into jobs after years of study – young lives now not able, even for a moment, to breathe, travel, explore, discover, reflect and mature. At the most idealistic time of their lives, they are seized of the chance to find a sense of meaning that will propel them in the rest of their lives. They are the middle-aged, who, after great sacrifice have schooled their children, served their communities, and are now being slammed with bank foreclosures. They are the elderly, for whom superannuation now means little or nothing. They are often leaderless, but consensual and practical. They, rather than hidden controllers, write the placards for themselves; which they raise above their heads to proclaim their hurt and anger to their representatives who do not represent. And to their country. And to a world which, on the instant, sees, for example, police forces at the behest of their political masters being mobilized to suppress this grassroots uprising. They see sections of the media who, no less than the police, serve the moguls and political managers by sensationalizing and misreporting. The United States and India are going through similar upheavals, writes Thomas L. Friedman. Democratically elected governments in both countries are so beholden to special interests they can no longer deliver reform. Therefore, they both need shock therapy from outside. GOA, India — The world’s two biggest democracies, India and the United States, are going through remarkably similar bouts of introspection. Both countries are witnessing grass-roots movements against corruption and excess. The difference is that Indians are protesting what is illegal — a system requiring bribes at every level of governance to get anything done. And Americans are protesting what is legal — a system of Supreme Court-sanctioned bribery in the form of campaign donations that have enabled the financial-services industry to effectively buy the U.S. Congress, and both political parties, and thereby resist curbs on risk-taking. But the similarities do not stop there. What has brought millions of Indians into the streets to support the India Against Corruption movement and what seems to have triggered not only the Occupy Wall Street movement but also initiatives like Americanselect.org — a centrist group planning to use the Internet to nominate an independent presidential candidate — is a sense that both countries have democratically elected governments that are so beholden to special interests that they can no longer deliver reform. Therefore, they both need shock therapy from outside. The big difference is that, in America, the Occupy Wall Street movement has no leader and no consensus demand. And while it enjoys a lot of passive support, its activist base is small. India Against Corruption has millions of followers and a charismatic leader, the social activist Anna Hazare, who went on a hunger strike until the Indian Parliament agreed to create an independent ombudsman with the staff and powers to investigate and prosecute corruption at every level of Indian governance and to do so in this next session of Parliament. A furious debate is now raging here over how to ensure that such an ombudsman doesn’t turn into an Indian “Big Brother,” but some new ombudsman position appears likely to be created. That said, there are still many parallels between the Indian and U.S. movements. Both seem to have been spurred to action by a sense that corruption or financial excess had crossed some red lines. In the United States, despite the fact that elements of the financial-services industry nearly sank the economy in 2008, that same industry is still managing to blunt sensible reform efforts because it has so much money to sway Congress. It seems to have learned nothing. People are angry. Meanwhile, in India, the commodities and telecommunications booms, coupled with urbanization that is driving up land prices, have set loose billions of rupees, and officials who control zoning and mining permits have just been pigging out. Some 50 top officials have been jailed lately for everything from the crony allocation of wireless spectrum, leading to potential losses to the state of up to $38 billion, to illicitly selling Indian iron ore — needed for development here — to China for a higher price. People are fed up. Yet, commented the Indian writer Chetan Bhagat in The Times of India on Monday, “our government attacks almost every anti-corruption crusader” and “sadly, even our opposition parties have lots of corrupt people.” Sound familiar? Democracy not only needs a decent ruling party, but an intelligent opposition, and neither India nor America has both today. Yes, Indians are mad at a system that makes them pay a bribe to get their birth certificate. Americans are mad at a system that has made it legal for unions to bribe the officials who will decide their pay and for bankers to bribe the lawmakers who will decide how much risk they can take. But both are essentially threatened by the same disease, best captured in the title of Robert Kaiser’s book about lobbying — “So Damn Much Money” — and it’s being thrown around now by so many special interests that these democracies are not only being warped by it but can’t fix themselves either. Hazare has called this moment India’s “second struggle for independence.” I think he is on to something for both India and America. I think that repairing our respective dysfunctional democracies — so they are truly enablers for the 21st century and not inhibitors in India’s case or “the sum of all lobbies” in America’s case — is for our generation what the independence movement in India and the civil-rights movement in America were for our parents’ generation. Here’s hoping we’re as successful. Like so many devotees, especially those close to Sathya Sai Baba, ex-foremost leader of the Sathya Sai Organization (outside India), the Dr John Hislop knew very well that Sai Baba told lies. Devotees, however, pass these off as, variously, “Baba’s funny little ways”; “his sparing of our feelings”; his “Leelas” (meaning his ‘divine sportiveness’ …. When writing, they use a capital ‘L’); “his perfect ‘Truth’, but our human imperfection” which cannot see that he is teaching us some profound lesson, such as, in learning detachment; and more such Procrustean wracking of human reason and commonsense. Sai Baba long exhorted that his devotees: “Love (him) for (his) Mystery”. 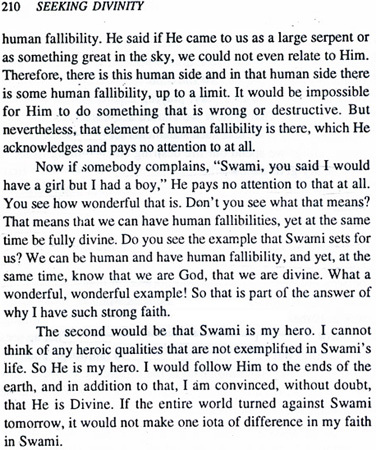 (Of course, his editors and other devotee writers capitalized the ‘h’ in ‘him’ and ‘his’) …..
Hislop also well knew that many devotees Sai Baba confused many with his many lies, all his predictions which failed, as did so many of his promised cures and e.g., promises of placements at his university or his colleges, of apartments in the ashram, and so forth. Therefore, in his books and talks (he travelled to various countries as Sathya Sai Baba’s foremost emissary outside India), Jack Hislop needed to come up with covering explanations. I didn’t get to know Hislop at all well. My acquaintance was primarily via a meeting I arranged (the idea of which was to attract from among the international devotee base the gift of books, audio-visual teaching aids, and so on). This was when I lectured in English at the Sathya Sai college outside Bangalore. But my impression was that of many who did knew him, who thought him sincere. In so many devotees, sincerity is writ large – but it hides the fact that a psychology of self-deception is powerful. John Hislop’s Successor, Dr Michael Goldstein of Covena, southern California, USA, is now world leader of the international Sathya Sai Organization, which Sai Baba said is THE divine organization on earth. But it is a multi-billion dollar organization with iron-clad, cultic rules. Goldstein exploded with unprovoked anger, not realizing that the BBC had a hidden camera trained on him …. Goldstein’s Sathya Sai Anger Mismanagement Course! Priddy notes: “Dr John Hislop, who was for long head of Sathya Sai Baba’s organization in USA and (strangely) ‘the Americas’, wrote most revealing and embarrassing letters in 1980-81. These came into the hands of Timothy Conway Ph.D., from his immediate predecessor the former president of the San Francisco Sathya Sai Centre. This is the third in the series of letters by Hislop dealing with the allegations by Mrs. Payne (see her letter here). The first Hislop reaction is here and the second here”. “On countless occasions, the international Sathya Sai Organization has either refused to deal with serious allegations outright or avoided all questions from dissidents and journalists. If they had any self-respect, truthfulness and regard for democratic ways, rank-and-file members of the organization would demand accountability and transparency. They would also be concerned about why so many respected institutions avoid association with their organization, and why political and government leaders refuse invitations to Sai Organization functions. Members need to heed their own feelings of misgiving at the explanations their leaders give to them”. Former devotee outreach to key public institutions was enormous. This activity was a concerted international effort in which now former Sai Baba followers – coming from many professional, trade backgrounds and cultural backgrounds – did their best, first, to warn of the danger of boys and young men coming into the orbit of Sathya Sai Baba. No truthful explanation would resolve the many contradictions in Sai Baba’s published discourses. Academics such as Robert Priddy and Brian Steel have scrutinized much of this literature. Those who retaliated – chiefly Gerald ‘Joe’ Moreno – are so poorly educated, viciously name-calling, distortive in interpretations, and prone to serious offenses against logical argument that no serious reader can take them seriously. Indeed, Wikipedia banned them. To those coordinating activities, such as Glen Meloy, Hari Sampath, myself and, as time passed, Robert Priddy, the sheer volume and richness of evidence strikingly and repeatedly verified accounts. In some instances, parents of boys and young men and other abuse survivors went to foremost heads of the Sathya Sai Organization, including Dr John Hislop, Dr Michael Goldstein, Phyllis Kristal, Sri T. Ramananthan, Dr Sarah Pavan and others. These supposed pillars of righteousness shamefully ignored the complainants. The leaders exhibited text-book examples of that psychological denial so commonly found in autocratic, cultic arenas. It is a terrible chapter in institutional abuse history. Let there be no ‘statute of limitation’! The terrible acts, sexual and other, outraged many young and innocent lives. Historians need to look at the sheer scale of the ethical betrayal. What is more, academics who duck for cover and refuse to study ‘difficult’ areas such as cults, should themselves be exposed. So too should those politicians and academics who, with a distorted understanding of what ‘liberalism’ really means. In their notions about not giving offense to various faiths, they are insipid in the extreme. In short, there is a farcical ‘political correctness’ – one that fears to give offense when, all the while, cults perpetrate great offense. If society is to come to grips with issues of cultism, writers will need to get beyond just looking at more spectacular and dramatic cults like the Jim Jones or David Koresh cults. Society suffers greatly when there is no well-publicised, properly-researched, non-sensationalistic enquiry into the effect of cults on the rest of society. For lack of understanding these less dramatic but, in some ways, no less invidious cultic phenomena, the Sathya Sai Organization continue to penetrate and influence, without, however, recruiting wider communities throughout the world. Among both their own membership AND in their outreach to institutions and governments, the Sathya Sai Organization leaders act as though nothing questionable has happened. Why should these leaders escape question? Their crimes of complicity are too great to ignore. In processing the immense amount of work on testimony, and in supporting the Sai Baba’s devastated survivors, our international coordinators often found that many witnesses clearly had no knowledge of each other. Still further, evidence came from sources well beyond former devotees. Sai Baba had not only practised his sexual and other abuses on his immediate followers but on others who were spiritual seekers traveling through India from one ashram to another. Despite the huge damage to it since 2000 – when we made professional submissions to major media, the UN, various governments, Interpol, FBI, and other foremost agencies – the international Sathya Sai Organization to this day, is highly evasive. We can expect this type of response from organizations with a great deal to hide. The ‘secret swami’s’ key followers are secret just as he was secret when Sai Baba hid his vast millions in currency, gold, silver and other precious commodities in his private quarters. Secrecy runs in the ‘Sai family’. Just as when he, complicit with local, state and national government leaders, concealed the facts about the 1993 killings in his bedroom. And likewise, when he and his accomplices engaged in terrible threats and bribes when then he concealed his (and some subordinates’) serial sexual abuse of boys and young men. And, likewise, scandals such as the water projects, apartments and other scams. All of which, and more, left a huge wake of human suffering. Over many years, including 2011, Robert Priddy and I have received highly confidential accounts in which profound sexual disorientation has happened to survivors of Sai Baba’s sexual depredations, and, sometimes, those of servitors close to him. Although at much-reduced capacity, the Sathya Sai Organization, now in huge disarray after its founder died (April 2011) many years before the time he predicted, continues to act towards communities as though it is a respectable, conservative organization. This does not surprise – for, against massive odds, it struggles to find funding resources to match its incredible overheads. Nor does it surprise that, as the organization continues to face such grave threats to its existence, it refuses to face questions from many quarters. These include institutions and people (typically wealthy and powerful) with whom the cult tries to link. The public damage to it is vast. Some members, naïvely, try from within it to reform the organization. But there is a sorry trail in which the Sathya Sai Organization has cast out long-respected leaders and other members who have been courageous enough to raise questions. Senior journalists from the several of the world’s top media and scholars from leading universities and others who have tried to investigate, are at one: this is a highly secretive, authoritarian cult. Where can the Sathya Sai cult turn – its distraught, broken founder being now dead, except in on its distraught – broken self? Will Sai Baba Keep Hal Honig Smiling? Guardians of Our Young? Or De Facto Sexual Abuse Pimps?